The road Eastwards is one of the few tarmaced roads in Mauritania and basicly connects one dusty desert town after another. First there was Aleg, where we stayed in the least dilapitaded hotel we found, eating safe things as bread and cans of sardines, as the street stal food was not trusted. Then it was onto Kiffa, but as we drove out of Aleg, there was no fuel to be found. They assured us there was fuel in the next town, but as things go, this was ofcourse not true. We had a discussion on what to do, as we could drive on for about 100 km before we ran out, but we certainly wouldn't get to Kiffa. For about an hour we searched and questionned the inhabitants for the precious liquid and in the end the solution came in the form of Mr Idoumou , the 'grand chef du tourisme' in the south of Mauritania, who rolled the window of his mercedes down and greeted us in perfect English, asking what we needed. He offered to send a taxi with fuel from Nouakchott, but luckily found some fuel from the army within 20 minutes and we were left with no choise but to pay the 60 euro for 20 litres he had on offer. This fuel just got all of us to Kiffa, where I put 23.9 litres in my 23 litre tank at the one gasstation that had unleaded fuel. The problem here is that everybody drives diesel cars and the are no mopeds, so no need for unleaded. We stayed at 'Le Phare du Desert' but left the breakfast untouched as the water for the coffee had the same merky taste as the night before, and with our tanks full we set of to the last stop in this sandy hell, Ayoun El Atrous. Because I couldn't care about looking for another hotel, we just stayed where I stayed last year, again having dinner in the form of bread and sardines,as the chicken we ordered in the plastic flower restaurant was lukewarm and wisely refused. 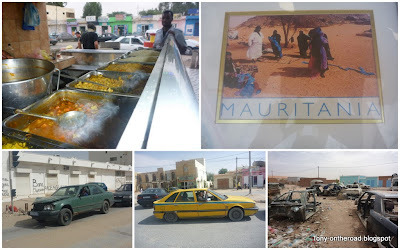 So next morning I was in good spirits to leave for the border with Mali, and after 130 km we checked out of SandLand dodging the bribe attempt at the customs office and repeating it one the Mali side, as they too asked for money to put the stamp in the passport. Cheap it was not going to be as we had to get the 'ecowas' insurance for 2 months and a pretty expensive 'laissez passer' which had to be stamped by the police, and guess what, they also wanted our money. When Charlie insisted on a receipt, we got into an arguement as they were claiming they had no receipts because it was sunday. In the end we payed up and drove to our first stop in black africa at Diema. In Diema we paid a visit to Pam and her Village Ventures programme and it was nice seeing she was doing well. She build a couple of new houses and was busy with some other projects too.The village of Diema is very lucky with such a dedicated lady. We spend the night in her new luxerious hut and in the morning I was anxious to get to Bamako where I would meet up with my Belgian friend Tom. For months now, we had the plan to buy a moped in Bamako and drive around Mali for a couple of weeks going from small village to village, and expierencing the real Africa. So early morning I was on my way to meet him, driving very slowly, cause my motorcycle chain was about to break. The day before I noticed one link of the chain was damaged, but the bike was still driveble. At a steady pace of 70 km/u I purred toward the capital to arrive just past noon. My friend was waiting for me at 'the sleeping camel' as promised and I was glad I was able to keep my promise of getting there in time after 4 weeks and 6800 km of driving. Moreso, he had all the presents with him that I told him to take. He managed to check in with Brussels Airlines with my back tyre, 4 litres of motorcycle oil and loads of other stuff. It felt like a late christmas and now we are here in Bamako, sorting out what little bike we can buy for him. It's probably going to be a Chinese one, I'll post a picture soon.